Gunmen riding camels shot and wounded six people in an attack on a camp housing thousands of people displaced by the brutal conflict in Sudan's Darfur, residents said on Sunday. The attack came late on Saturday at the Kalma camp in South Darfur, one of the largest settlements of people displaced by the violence. 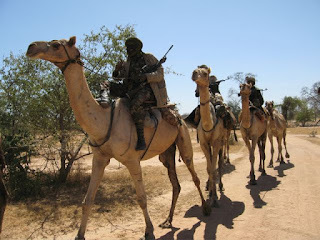 "Militiamen on camels attacked the camp and began shooting... six people have been wounded," Abdelrazi Mohamed, a resident of Kalma told AFP by telephone, adding the incident occurred at around 21:00 pm (18:00 GMT) on Saturday. Sources in the United Nations confirmed the incident but had no immediate details. Kalma, often described as the size of a small city, houses about 100 000 people displaced by the conflict in Darfur. The highly charged camp is awash with weapons and is a stronghold for representatives of multiple rebel groups. The camp has seen several deadly incidents over the years, including attacks that have caused multiple fatalities. The UN's independent expert on human rights in Sudan, Aristide Nononsi, said following a visit to Darfur last week that security there remained "fluid and unpredictable". He said internally displaced people "live in a state of insecurity due to the presence of various armed elements and criminality that occur within the region". Overall more than 2.5 million people have been displaced by the conflict in Darfur that erupted in 2003, and according to UN figures 300 000 have been killed in the conflict. The conflict broke out when ethnic minority rebels in Darfur mounted an insurgency against the Arab-dominated government of President Omar al-Bashir - who is wanted for alleged war crimes in the conflict -- complaining of economic and political marginalisation. Khartoum however insists that the crisis in Darfur has ended following a referendum held there between April 11 and 13. Almost 98% of voters of Darfur opted for maintaining the region as five separate states, according to the result of the referendum released by Khartoum. Darfur was a single region until 1994 when Bashir's government split it into three states, and later added another two in 2012, claiming it would make local government more efficient.